This PDF 1.5 document has been generated by Microsoft® Word 2010, and has been sent on pdf-archive.com on 14/04/2018 at 21:41, from IP address 182.75.x.x. The current document download page has been viewed 120 times. 1. 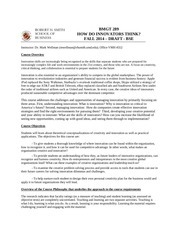 Scope and objective of the course: The course aims to promote and develop creative thinking and problem solving skills. The main objective is to help learners think outside the box and approach problems in the real world from a fresh perspective. and failures involved in the process of being creative and introduces them to strategies to fare through such situations.  evaluate an idea for its creativity. RB2: Edward De Bono, “Lateral Thinking: A Textbook of Creativity”, Penguin, 2016. RB3: Dorte Nielsen, “Creative Thinker's Exercise Book”, BIS Publishers, 2016. RB4: Kathryn P Haydon, “Creativity for Everybody”, Sparkitivity LLC, 2015.
used for teaching certain topics. specific? Are creative people mad? 5. Chamber Consultation Hours: Slots will be decided in the classroom. 6. 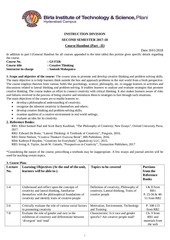 Notices: Notices concerning the course will be displayed on the CMS. 7. Make-up Policy: Make-up will be given only in genuine cases (subject to verification). students throughout the semester and no type of academic dishonesty is acceptable. This file has been shared by a user of PDF Archive. Document ID: 00756787.